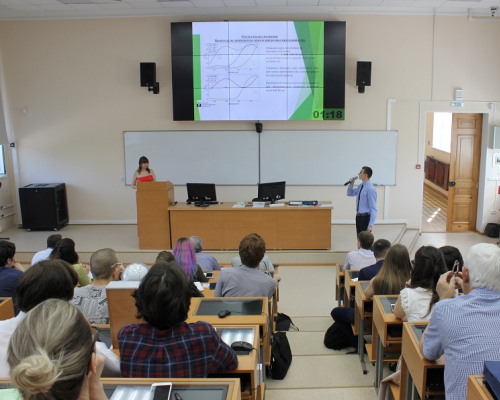 Tomsk Polytechnic University ran the Physical Battle for bachelor and master students of Russian and foreign universities, which are going to pursue their master and PhD programs at TPU. Its winners will undergo internships at the world's science and education centers and receive an additional scholarship of about 30 thousand rubles per month. The battle was run in two stages including a correspondence and a full-time stage where finalists presented their scientific reports to an expert jury consisting of leading physicists from Tomsk Polytechnic University. According to the rules of the competition, each participant had to present his research within three minutes. Totally, 20 students of bachelor, specialist, and master programs from different Tomsk universities passed to the second round. They participated in two nominations: Students and Postgraduate Students. The master student from TSU Faculty of Physics Oleg Kolesnikov won the grand-prix in the Postgraduate Students nomination. He is going to continue his research at Tomsk Polytechnic University. The winners of the Physical Battle will receive certificates for internships at the world’s leading research centers. The future TPU students will be able to choose an institution based on their scientific interests. In addition, both the winners and the laureates of the competition will receive additional scholarships in the amount of up to 30 thousand rubles per month during the upcoming fall term. The scholarships and the certificates will be granted to those winners and laureates who will joint PhD programs at the TPU Research School of High Energy Physics or master programs at TPU and conduct research within the School. Currently, there are 13 laboratories and research groups within the Research School of High Energy Physics.